The Menzies Strathmore hotel is now closed. We have a great choice of alternative hotels at Luton Airport. For a similar stay, we recommend the nearby Hilton Garden Inn. If you're after luxury and convenience, but don't want to be right at the airport, then you're looking for the Menzies Strathmore. Between the AA rosette-winning restaurant and the 15-metre pool and spa, you'll find it hard to believe this hotel is just over two miles from the terminal. Why settle for one holiday when you can start off with a mini city break before you even arrive at the airport? An excellent place to night stop between flights from Luton. The leisure facilities gave us a good start to the day and helped the morning pass quickly. Apart from the small room everything was great. Very impressed by service and quality of food at dinner and breakfast. Will stay again. Parking for the night was just a pound, not sure that will last long. The TV was not working properly and I really needed to relax. There was an issue in the whole hotel. I did find the staff very easy to talk to and they were helpful. I really appreciated the wake up call and transfer to the airport. Our flight left too early for us to have a breakfast, yet no provision is made for guests like us. Otherwise, I'd have given you a 10 - something I rarely do. Your staff were the most helpful and obliging, and your swim/sauna/steam/jaccuzzi spa so relaxing after a stressful packing and first leg of our journey. See you again! 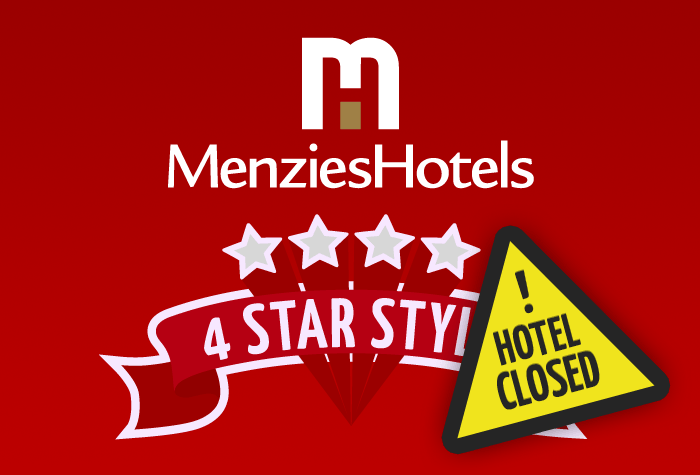 Our customers rated Menzies Strathmore on average 7/10 (5 reviews). Read Menzies Strathmore reviews. You can check in from 2pm. Leave the M1 at junction 10 and take Airport Way. At the next roundabout, take the first exit onto London Road. At the next roundabout, take the third exit onto Park Viaduct. Then take the first exit at the next roundabout onto St Mary�s Road, which becomes Church Street, and the first exit again at the next roundabout onto Guildford Street. Take the first left into Cheapside, and you will find the entrance to the hotel inside the central car park. If you're parking overnight, you'll need to park in the multi-storey car park on top of the shopping centre. It's free between 6pm and 8am, then there's an hourly charge up to a maximum of £8 per day. You'll be given a token at the entrance barrier which you'll need to get out again the next morning. The hotel is about half a mile from Luton train station. You could get a taxi, or walk - just turn left out of the station, then right onto Bute Street, and you'll see the hotel on your left after about five minutes - but there aren't pavements all the way. You must check out by 11am. A taxi to take you to the airport will cost about £10 - you can book through reception. Sit in back style: Whether you want to sit back and relax or splash about, you'll find what you need here. There are more leisure facilities than you can shake a stick at, including a 15-metre pool, a gym and a spa. Eat in style: If stylish dining is the order of the day, it's coming right up. The sophisticated, appealing food in the Brasserie restaurant has won it an AA rosette. Sleep in style: The classy rooms are far too comfortable for counting sheep to be necessary. They have all the home comforts, free WiFi and you'll even get a bathrobe and slippers. Set-off in style: After parking overnight in the hotel's car park, just drive your car to Airparks in the morning. They'll park your car for you and get you to the airport in 15 minutes. Disabled facilities The hotel has one disabled room, and is completely accessible to disabled guests.